Outdoor wall mounted fans are ideal for refreshing yards, porches, and even barbecue spaces. As they mount on any wall, you can save a lot of space and distribute better the air by mounting them as height as you need. Of course, the fact that you need a wall is a bit of a limitation but that makes them ideal for small spaces that are near the house, offices, medical consulting rooms, or even inside patios. 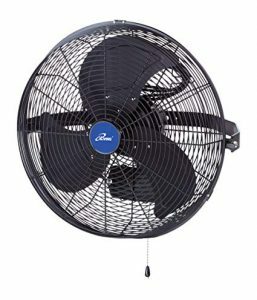 Also, these fans tend to be incredibly powerful and some may even be functional for industrial spaces where the heat concentrates due to the machines. Pergolas and beach houses are places that can also benefit from these devices, especially if they wet rated wall mounted outdoor fans. 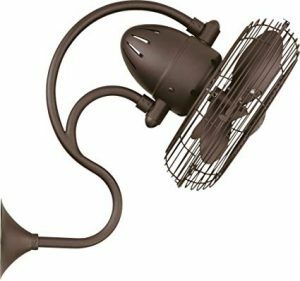 If any of these is your case or if you simply live and a really hot place with walls to sustain a fan, you need to check this list of the best outdoor wall mounted fans. Ideal for workplaces, workshops or even patios, this is a basic that covers all the needs for an outdoor oscillating fan wall mount. While it says it is 24” it may be actually a bit bigger due to the mounting bracket but luckily, it moves a lot of air so it makes for that detail. On the other hand, it’s not strong enough for ventilating open outdoor yards or spaces and is not recommended either for offices or closed indoors that need a level of quietness since it’s considerably loud. Strong airflow for big indoor spaces or semi-outdoors. Easy to assemble and mount to the wall. Oscillates and can be adjusted for up or down positioning. Oscillation is only 90º and not 180º as the description says. The adjustability up/down is a really short range. Vibrates a lot and is a bit noisy. The pull switch for speed change is not the best quality. This small wall mount fan is perfect for offices or any workplace, classroom, controls room or areas where space is limited. One of the smallest models in the market still offers a lot of airflow power for its size. Very adjustable and with comfortable controls, you can adapt the potency to your needs. As it’s made from plastic, it would be wise to keep it away from machinery so the heat won’t affect the structure. But thanks to its simple assembly grills, you won’t have any problem to install it in any convenient place. Whisper-quiet airflow makes it ideal for offices or cubicles. 3 speeds for adjusting to your airflow needs. Cord pull for on/off and plastic switch for selecting speed makes it easy to manage. Grills are zinc plated for avoid rusting or melting. Tilting head for directing the air. The plastic structure could melt down if exposed to great heat for long periods. Not ideal for large spaces as the size doesn’t allow for a very strong airflow. Several users report motor failure issues. While it advertises to be a 13” fan, the truth is that only the head radium is that size, but this decorative wall mounted fan is 20” with the mounting base. Nevertheless, the beautiful decorative design makes for it as it still fits in small places while disguising very well as part of the decoration, especially for those places with an antique-like décor. Unlike many models of this size, this little fan is actually very powerful and any of its three speeds offer a great airflow. It’s ideal for both inside and outside small spaces, even very hot closed rooms such as machine rooms. It’s really strong and metal-made so it won’t melt or fall apart with time. 3 metal blades with 31° pitch for superb airflow. 30° downward when mounted for a height positioning. Includes side mounted wall junction box. If you want to change the motor angle and projection you need to alter the gooseneck. If power is what you’re looking for then this is the outdoor wall mounted fan for you. While most models have only one or two ways to be mounted this model offers a stabilizing bar that allows mounting on walls, ceilings, structures and anywhere where there’s not much floor or wall space. While the features are quite basic, this fan highlights for its duration and effectiveness while not being too fancy or expensive. 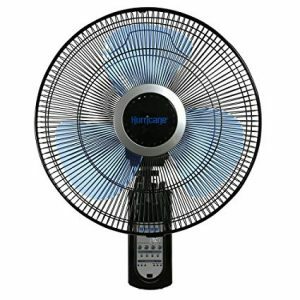 It’s definitely a heavy-duty fan that will last for years in any environment you use it, thanks to its rugged metal structure, aluminum blades, and steel guard material. Super strong airflow ideal for very big spaces such as warehouses, greenhouses, porches, pergolas, patios, etc. Very easily mounted with included brackets and hardware. The thermally protected motor will shut down in case of overheating. Oscillating controls and tilting head. The oscillating is rough and may get damaged soon. The assembling gears are plastic and can be damaged. 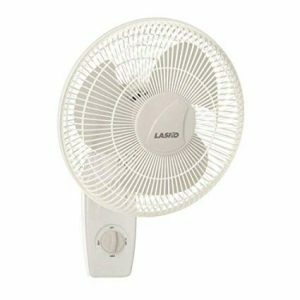 This wall mounted oscillating fan with remote is without a doubt the best options in technology and features when it comes to outdoor wall mounted fans. While it’s incredibly potent thanks to its 8 pattern technology, it works in a quieter way than most outdoor fans, and it’s smaller than the previous brother model, which makes it perfect for insides too. Perfect for greenhouses, workshops, large living rooms, patios, pergolas and almost any big or open spaces that need a help with the heat. As we mentioned, technology is the highlight point on this powerful fan; it not only has the 8 pattern technology that allows it for better airflow and the remote, but also other interesting tech features and pros. 6 hours increment timer compatibility. Power back up to its previous settings after a power cut. The remote is included and can control any other fan of the Super 8 family. The structure is metal gear with a super quiet technology. Figure air pattern allows a better distribution of the air. 3 speeds and 3 oscillating options for better adaptation. • The slowest speed can be too fast if you simply want a soft breeze, leaving you with no softer option. • The oscillation may be a bit uneven, oscillating more to the left than it does to the right. While Outdoor wall mounted fans are designed for surviving in the outside, this doesn’t necessarily mean “without cover”. Some of these fans can actually cool down a very large patio but they may remain undercover so the rain won’t affect them. 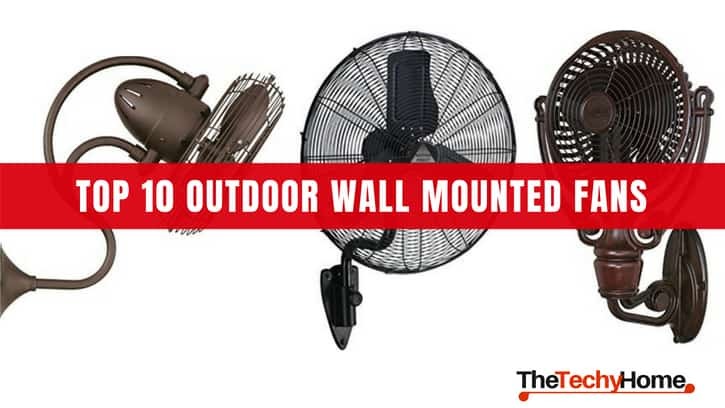 If you’re thinking of installing your outdoor wall mounted fan in a place with no roof, you need a specific type of fans called wet rated wall mounted outdoor fans. These products are specially designed to support different levels of damp climate, depending on how much humidity you think they will endure, you’ll have to pick more or less functional fans (sometimes sacrificing decorative purposes). Though some of the previous models were actually damp rated, they highlighted for other features, instead here are 5 wet rated wall mounted outdoor fans that highlight for their waterproof characteristic. 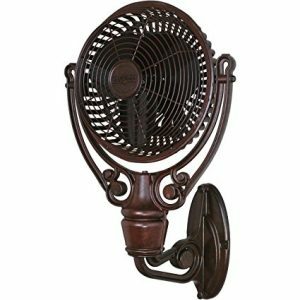 If a beautiful design is essential for you, then this Old Havana mounted fan is your best option. While it’s not made for enduring everyday rain, it is specially made for supporting very damp and humid climates for long periods. In this sense, it’s perfect for an outside party lounge, thematic yard, porch, deck or any outside space that especially needs decoration and refreshment. Don’t let yourself get fooled by the picture, and design, this fan is actually really big and will have enough airflow to cover your outdoor spaces. 3 speeds guarantee the necessary airflow for cooling down even in really hot days. Damp location rated for intermediate humidity. It has a beautiful antique/tropical design, ideal for refined and sophisticated décor. UL listed for top security. Not for CONSTANT wetting, only damp/humid locations with sporadic rain. The rusty finish can get damaged if too much rain falls over it. Very particular design, these outdoor wall mounted fans are perfect for literally killing two birds in a row. 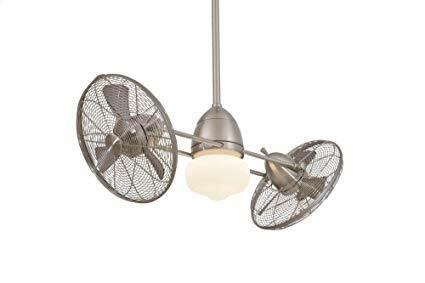 They include two fans and in between, there’s a 100-watt lamp. They’re brushed nickel covered for complete protection from humidity. As the two 3-bladed fans are positioned in different directions, it’s perfect for big spaces or really hot places where only one fan won’t be enough. The light and the fans can work separately. It’s completely wet rated so it endures the rain. The airflow is great and the oscillation goes in opposite directions so you won’t feel the lack of air. Wall control included for the 3 speeds, light dimming and reverse function. It’s smaller than one would expect for an outdoors fan, so it covers the same big space as one big fan. It includes the downrods for mounting on an angled ceiling of 21° but if the angle is bigger, you need to buy separate parts. 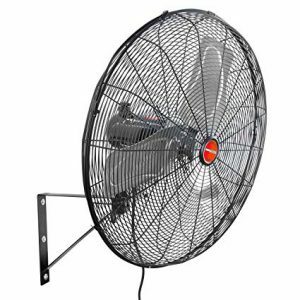 While a bit expensive, this wet resistant fan will endure the heaviest weather thanks to its double humidity resistant materials; completely sealed and thermally protected motor and corrosion resistant epoxy finish. 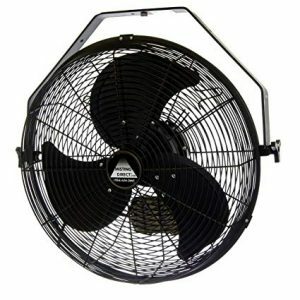 This fan will last years and will cool every outdoor space with its powerful airflow. Its tilting head allows you to position it in the way you need the airflow, but sadly it can’t be mounted in any other position than how it comes. Wet rated for wet and damp locations with heavy humidity resistance. All materials are wet resistant including the blades. 3 speeds with cord chain control, oscillation mode: on/off. Commercial grade assures top-quality functioning. It’s not very decorative or with technologic features. It’s really big, not ideal for small places. You can’t adjust the mounting. An even more powerful version of the previous model, this wet rated outdoor mounted fan is perfect for the commercial places as well as industrial locations, great patios, pergolas, and deck. Unlike the previous model, this can be mounted in walls, ceilings and pole structures to save as much space as you need or for those places with not so much space available. 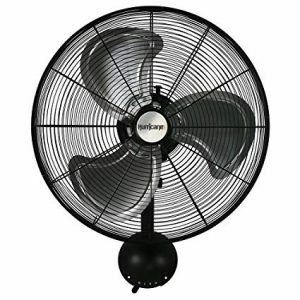 Completely sealed and protected industrial motor and corrosion resistant epoxy finish makes this fan as durable and water resistant as it might be, enduring as much rain as needed without any rust. 3 powerful speeds controlled by a pull chain. It’s fairly quiet for its strong airflow. Very strong structure lasts for years. The blades are not well balanced for every mounting position, they may need adjustments for ceiling and pole mounting. The middle and hard speed make the fan vibrate a little. 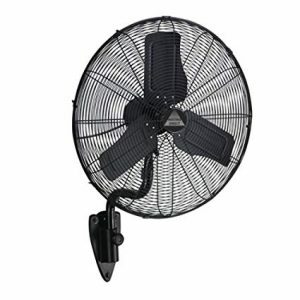 A considerably cheaper version of an equal quality wet resistant outdoor mounted fan. This waterproof fan will endure as much rain as needed and offer all the cooling you need for patios, pergolas, decks, greenhouses, etc. And also, is a perfect size and quiet enough for indoors. Unlike the previous models, this fan comes with factory balanced curved blades that will need no adjustment in any position you mount it. Its materials are top-quality and completely damp resistant with a galvanized steel frame, sealed and permanently lubricated industrial motor. A great amount of air for its size. 3 speeds controlled by pull cord chain. Its size and quiet technology make it perfect for indoors and outdoors. It can be mounted in walls, ceilings, and poles thanks to its mounting base. It can be adapted to become a misting fan. The misting kit must be bought separately and drains water very quick. The cord is made from plastic and may not be as durable as the fan.